In November 2017, artist and writer George Bray interviewed Hannah Rowan in her studio to discuss her work, research and influences. Shortly afterwards, Rowan departed for a research trip to the Atacama Desert, Chile, the driest place on earth. They met again in the summer of 2018, to discuss the influence this time in the Desert has had on her recent work and an upcoming show with La Wayaka Current at Guest Projects. The below text is written by George Bray in response to their conversation, with images from Hannah Rowan. 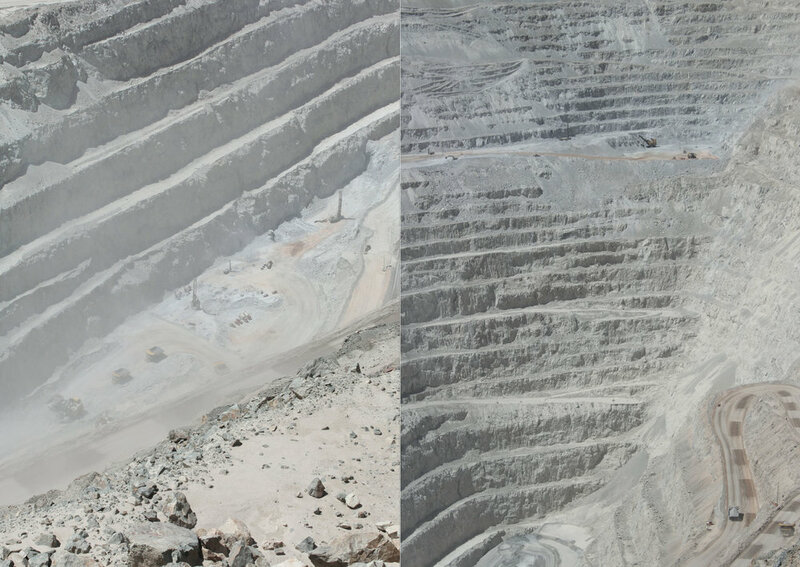 Chuquicamata copper mine located in the Atacama Desert, Hannah Rowan. Aerial View of Atacama Desert, Hannah Rowan. Hannah Rowan is an artist who makes sculptural works that meditate on the relationship between the slow geological time of natural processes and the fast paced, technology-driven frenetic activity of humans. She utilises both synthetic and organic materials in her ephemeral, multifaceted constructions; melting ice suspended from metal armatures, salt piles on horizontal planes, liquid tanks, casts, clamps and cabling are all used to make her modular assemblages. 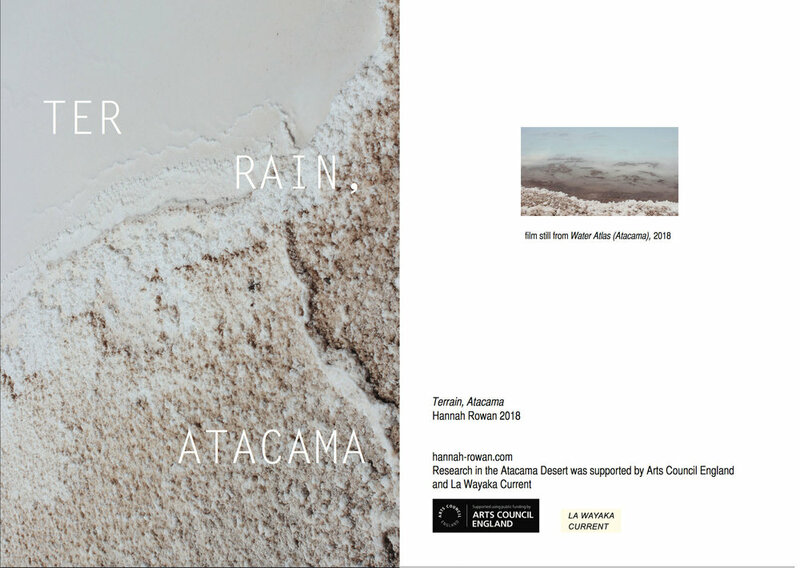 In Autumn 2017, Rowan embarked on an artist-led research project to Chile’s Atacama Desert, in collaboration with La Wayaka Current, an initiative that enables artists to embed themselves within communities living in some of the planet’s most extreme environments. 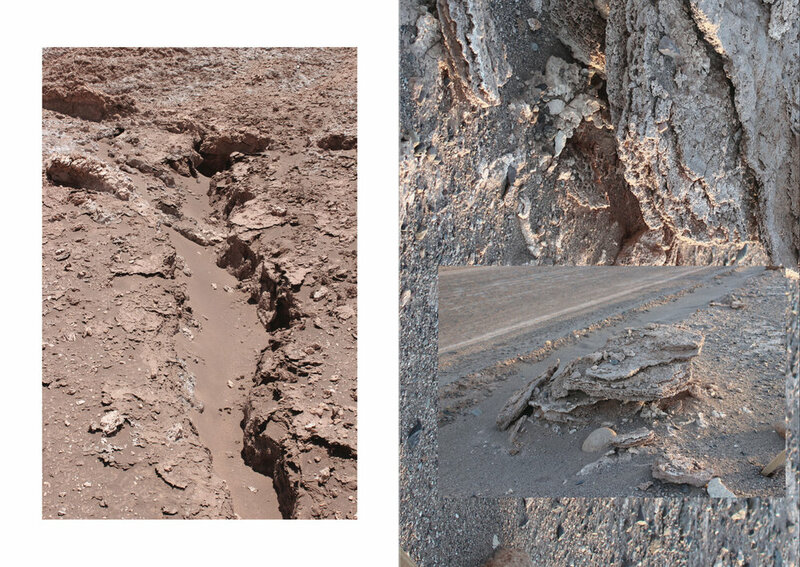 In the Atacama, Rowan spent time with the Likan Antai people, seeking to understand how human activity was affecting the area’s delicately balanced ecosystem and what the consequences were for the lived experience of the indigenous Atacameños. Water, in all its shifting states, has been key to much of the artist’s research - melting glaciers, rising sea levels, the effects of water in overabundance. 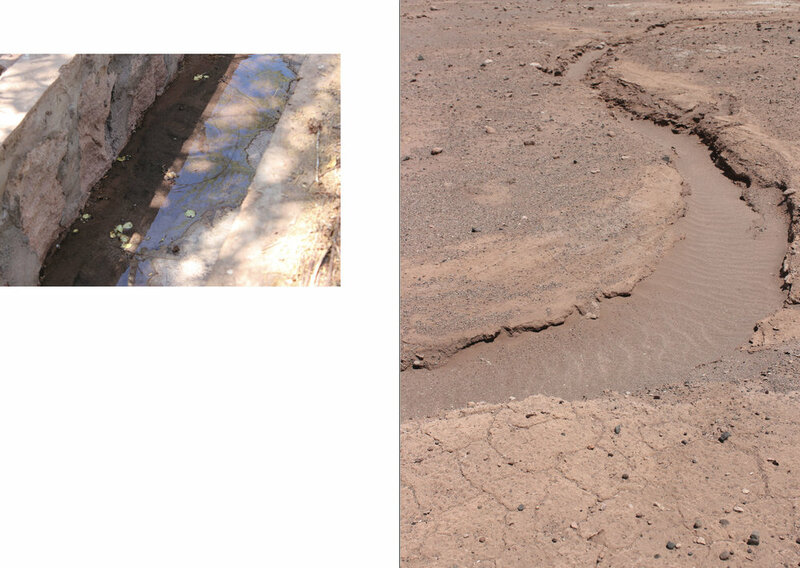 But in the world’s driest desert, the other end of the spectrum came into focus; it’s scarcity in the Atacama makes water acutely sacred to the local community but also has a massive bearing on the economy and politics of the region. 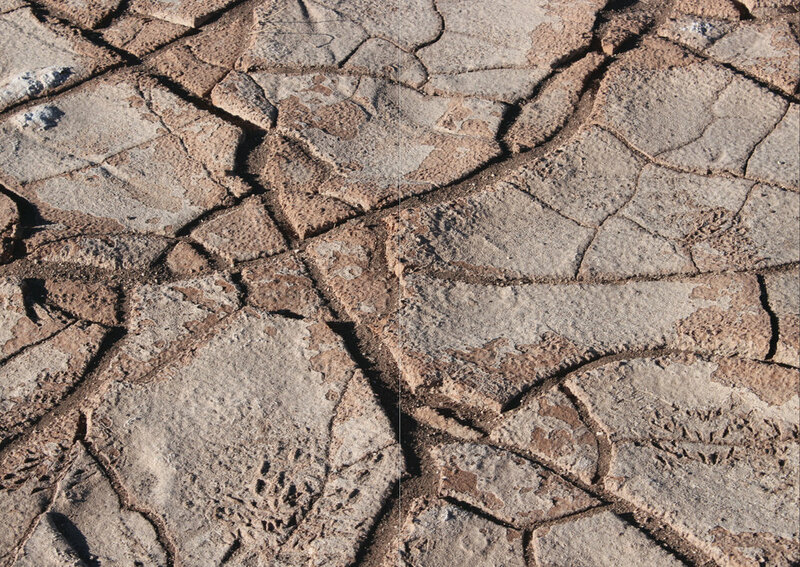 Chile produces 43% of the world’s lithium, which is extracted from the brine water that lies just below the desert’s surface, pumped up into massive evaporation fields that stretch across the salt flats for miles. Demand for lithium, valuable due to its central use in rechargeable batteries, has soared in tandem with the digital technology boom of recent decades. With the mining industry putting increased pressure on an already scant resource, questions of ownership, control and the environmental impact of water became central to Rowan’s research project. As an initial response, she began filming ‘Water Atlas’, documenting the few instances of flowing water that punctuated the barren, harsh white beauty of the desert, from the ancient still-functioning watercourses of the Incas, to the dribbling trickle of a pool pipe that takes days to fill up. 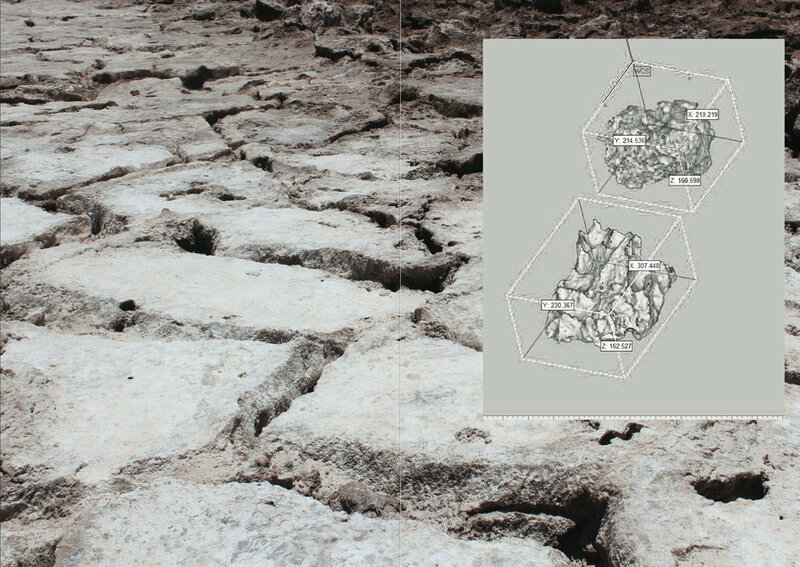 The interplay between natural resources and the advanced technology that relies on their extraction to exist, is interrogated in another series of documenting works, ‘Ghost Relics of the Atacama’: digital scans of the salt rock formations that carpet the desert, recreated in 3D-printed gypsum. These examples of organic material translated into synthetic objects have the feel of pixels made flesh and look like bleached white phantom fossils, physical embodiments of our desire to digitise the environment around us as though subconsciously preparing for a future post-human archaeology. 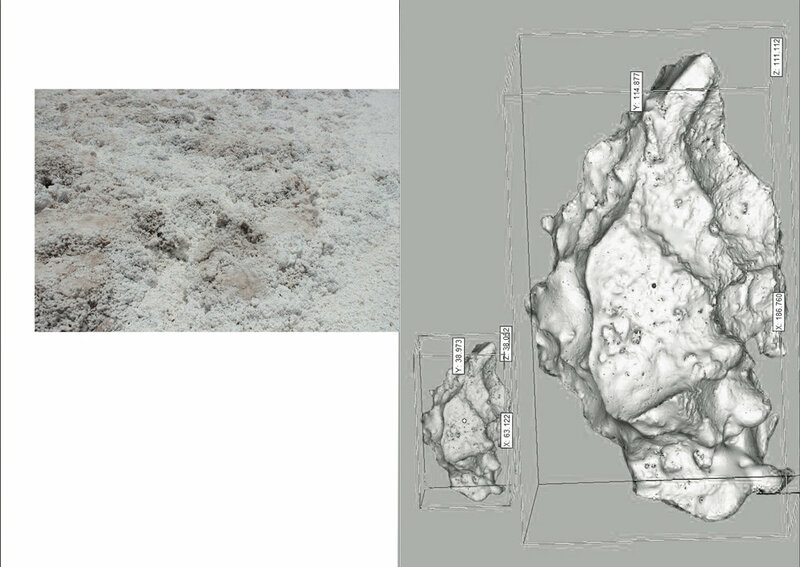 3D scans of salt crystals, Hannah Rowan, 2018. 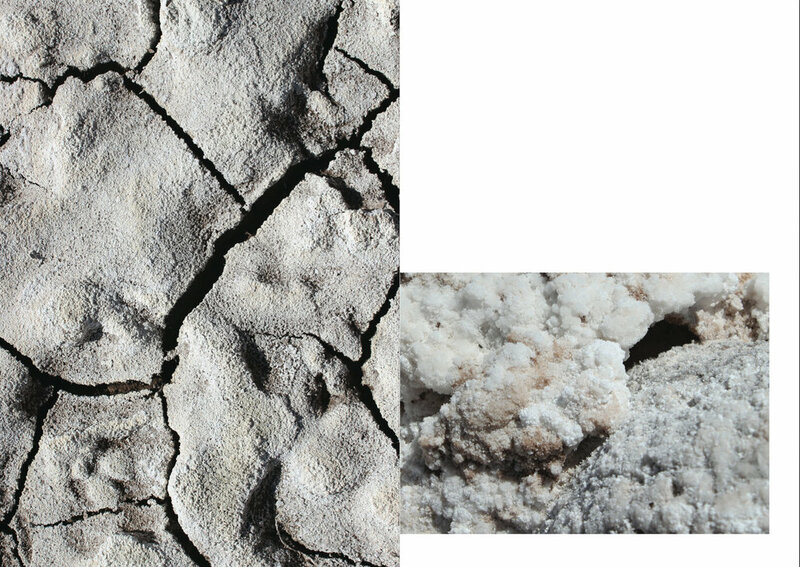 3D printed plaster powder salt rocks: Hannah Rowan, Melting Transmission (detail), 2018, image by Oskar Proctor. Lonely Tree, Hannah Rowan, 2018. The sparseness of the desert seems to have been incorporated into the rest of Rowan’s sculptural work, made on her return from Chile. 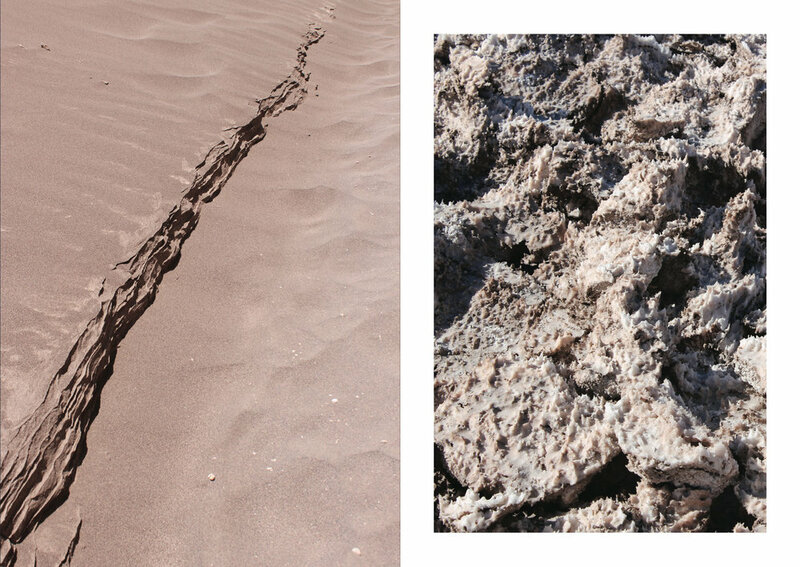 The compositions have become more streamlined, pared back, as though eroded by desert winds. Spindly, ossified plant stems have made their way into the mix for the first time and the sculptures now seem stiller and slower somehow. The metal apparatus that make up the bones of the structures feel more clean and clinical – meat hooks and ice screws – as though the natural materials are undergoing some sort of autopsy or are just about to be reanimated in some Frankensteinian experiment. These concerns with material, technology and the human impact on the world around us are shared by many of the artists who have worked in collaboration with La Wayaka Current, which linked them to remote communities who are already being impacted by rapid changes in climate, in an effort to bring their voices to the fore. In July 2018, Rowan’s work is being shown as part of a showcase of these artists at London’s Guest Projects, an experimental space initiated by the Yinka Shonibare studio. Rowan, a graduate of the RCA Sculpture programme, is following this with an edition show at Assembly Point, London, before embarking on a second residency at The Banff Centre, Canada, where she was artist in residence in 2016. 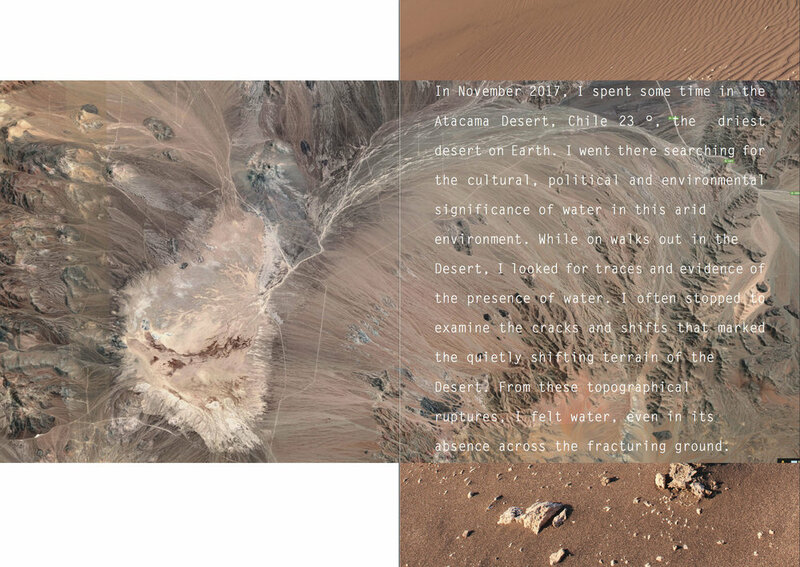 Next year, she aims to undertake a research trip to the Arctic as part of The Arctic Circle residency, to continue her work on ‘Water Atlas’, mapping the changing geology of one of the globe’s most intensively transforming environments. Hannah Rowan, 2018, 32 page book, printed as an edition of 50. viewable PDF below, book available on request. Text by George Bray: Interviewed in her studio in October 2017 for Squeeze in Here. Rowan uses a wide array of organic materials and quasi-scientific apparatus to create intriguing, seemingly fragile works that are informed by environmental concerns. These crystalline heaps are almost spilling over onto a floor that is littered with snaking power cables, scattered rocks and cylindrical plaster casts. The set-up is animated by glowing light bulbs and whirring fans, held in place on jutting armatures by clamps and bulldog clips, interacting with strips of image-laced acetate that stir like plastic caught on a wire fence. Components are linked together with trailing string or wire and are placed at different heights, meaning the eye is drawn from the floor up to nearly the ceiling in an effort to make sense of what’s going on. The studio is that of London-based artist Hannah Rowan (b.1990) and the multifarious elements on show are typical of those she uses in her work. Everything has a temporary feel, as though it could all be disassembled and reassembled in a rushed 20 minutes. This idea of things lasting for only a limited period of time seems relevant in many ways to Rowan’s work and partly helps to answer that question of what’s going on in her fragmentary installations.Her studio itself is an impermanent one; Rowan is in her final year at the Royal College of Art, occupying the soon to be demolished Sculpture building on the college’s Battersea campus. Since completing her BA five years ago, she has worked in a number of different spaces with finite time limits, a nomadic working practice familiar to many young artists, which has necessitated the lean towards portability in her work. The Liquid Fragment: Swimming in Data, Drowning in Melting Ice.